You know its that time again folks, more dromie madness. Antediluvian salad has a bit of a controversial history with these most pernicious of stem birds. You can be sure that part is not going to change, the controversial bit, that is. Making Dromaeosaurids Nasty Again Part I: Wing Pummeling Abuse In which I discuss the current state of affairs with regards to killing claw use and hypothesize that prey restraint by the foot "killing claw" coupled with clawed wing pummeling may have been utilized. As you will see in this post I no longer consider such a method of restraint and killing as preeminent. That is - shades of grey here folks - I don't think that both the raptor prey restraint model and the wing pummeling hypothesis were chief strategies for prey dispatch in most dromies. Could both style of attack been used on occasion by some dromies? Yes, but as I will explain both theses methods become vanishingly tenable tactics especially at larger sizes (hello Utahraptor). Making Dromaeosaurids Nasty Again Part II: No Shame in the Scavenging Game I start building the case for many dromies as excellent facultative scavengers. Not only is there fairly unequivocal fossil evidence for it, the size range of dromies slots in nicely to an ecological "sweet spot" where terrestrial scavenging is most utilitarian. 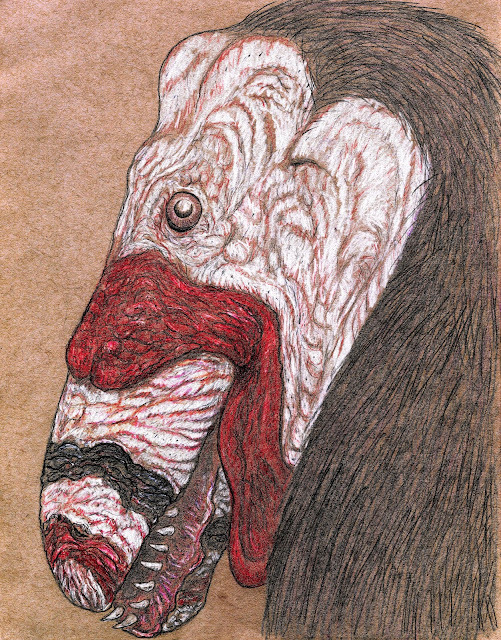 Also Dakotaraptor as a large, cursorial carcass bully. Making Dromaeosaurids Nasty Again Part III: Life Appearance - Dapper of Deranged Probably - at least based on the comments - the most controversial of the series. I would say it has held up nicely, especially in light of the compelling evidence that tyrant lizards "de-feathered" significantly. "Wut you mean that dromies did not all look like carbon copies of each other in the 100 million years of evolution they underwent? Get out!" Look folks it's not even that wild of a suggestion, in fact pretty common sense actually. Almost boringly so. Making Dromaeosaurids Nasty Again Part IV: New Hypotheses on Dromaeosaurid Feeding Technique & Role of Tail in Movement For me this was the most fun and interesting post in the series as it combines unusual oral feeding styles with a novel idea on dromaeosaur locomotive strategy. I introduced, for lack of a better term, the "woodpecker hypothesis" of dromie carcass feeding technique. In this scenario quick twitch muscles generated in the body vibrate culminating energy at the tooth tip where strange apically hooked serrations on the teeth allow the tooth to literally dig into carcasses. Several examples of worn dromie teeth and inexplicable bone damage on Tenontosaurus can be potentially explained by this hypothetical feeding style. I then discussed how the pattern of caudal rods in dromie tails could potentially work as an elastic recoil allowing energy efficient, long distance travel, useful for reaching ephemeral food sources and carcasses. I make the comparison to wolverines which, despite their short legs, are remarkable and unstoppable moderate paced long distance cursors. I augmented this suggestion with a review of dromie ichnological traces - the footprint record shows that these animals had not only large foot and toe pads but that they most likely cruised at a fairly high pace. Here I have to admit to having a bit of mud on face here folks as a frequent theme of my "Making Dromaeosaurids Nasty Again" series was a diminishing of the role of the killing claw in predatory endeavors, highlighting wing pummeling and biting as more preeminent tactics for dispatch while the feet grappled and held prey. So I'm gonna eat some crow here in coming around full circle in my opinion on that most famed of claws - foot ungual #2, aka the "killing claw" I now believe really was a killing claw just not in the way that we have been interpreting it. Full disclosure, the genesis of this idea is not mine own although after mulling it over and especially with the Utahraptor reveals I think it should be the leading hypothesis. What I want to document is the transmutations and permutations an evolving hypothesis should go through and in this case I believe did go. New ideas rarely come fully realized and perfected into the world. They need refinement. In the case of this idea which I will dub the "pierced from within" hypothesis the first semblance of it to my knowledge was put forth by Kenneth Carpenter. However the man who improved - but didn't perfect it - is.... wait for it... a certain chap named John Jackson. Upon writing that name I can almost hear the sound of mouses clicking on the close window for this page. But bear with me. To those uninitiated John Jackson is best known as a chief proponent of the "Birds Came First" BCF idea of theropod/dinosaur evolution. He also has a reputation online for a particularly prickly correspondence to put it mildly. You can do your own internet sleuthing on John Jackson if you are new to this idea or the man - here is a good place to start (read comments). But let me unequivocally state I don't subscribe to the BCF idea of dinosaur/bird evolution (ironically someone brought up a retooled version of this in the comments from my last post). I'll admit it had a certain intuitive appeal to it in the 90's and was fresh and original - but the evidence has not borne it out. John got in contact with me after reading several of my dromaeosaurid posts and we had a brief series of email exchanges (we don't correspond anymore, you can take a wild guess why). I try to keep an open mind on things and gave his self published book - The Secret Dinobird Story (free on kindle) - a read. The book is a bit of a slog to get through, and I told John this. I came away still unconvinced about BCF and this post is not about this topic nor do I want to discuss BCF in the comments. But nestled within John's writings on the philosophy of science, unorthodox family trees, "arboreal stem dinos", and complete eschewing of cladistics ( I have problems with cladistics too but don't think we should discount them), is hidden what I believe is an important and unrecognized broad stroke analysis of how dromaeosaurids actually used the famed killing claw. I can only assume that people who know of John or have perused his book glossed over his bit on the killing claw. It is in my opinion an unpolished gem and should see the light of day. With whatever light I can give this idea I will shine upon it. 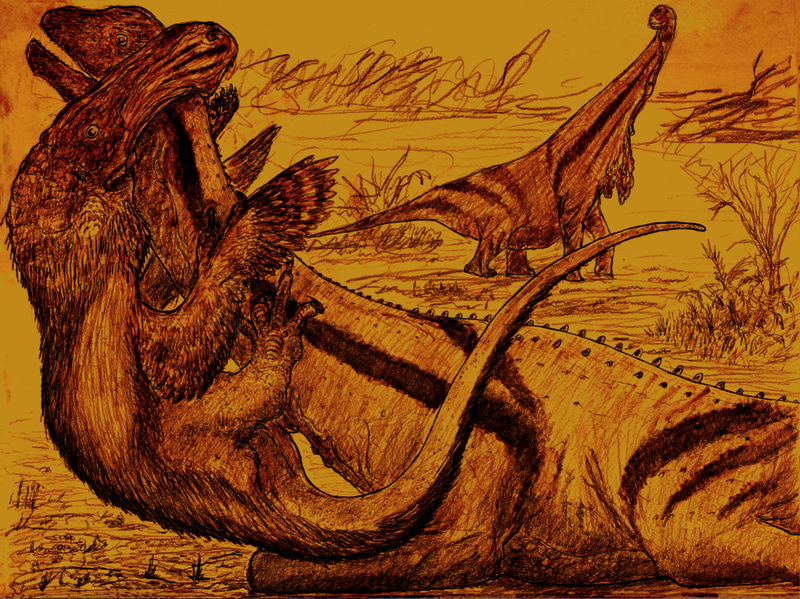 The killing claw is not a tool used as a crampon to hang onto the sides of other dinosaurs, nor is it a tool used to pin and hold subequal sized prey items ala the raptor prey restraint hypothesis. It is a tool used with almost surgical precision to slice into and penetrate a prey item in select spots. Such a claw is not optimized to scythe style cut long gashes in the tough hides of prey but instead cuts a single entry hole into prey. A laterally compressed horny sheath with a cutting edge can, after the initial entry into said prey item, now repeatedly plunge into, explore, and cut into the underlying soft tissues. Such trauma will perforate vessels, arteries, lungs, and viscera. Although from the outside trauma will be evinced by a simple entry hole the interior damage will be substantial and often times fatal. Arms and/or jaws assist in stabilizing struggling prey in such a manner to allow entry of killing claws into prey for fatal dispatch. Such a tool is every bit the theropod equivalent to saber - toothed predators and allowed dromaeosaurids an ability to punch well above their weight class in predatory endeavors. John called it the toe and tail, grab and stab method. He believed that the caudal tendons of the tail worked somehow to help "kick into" the prey item deeper but the (unpublished) revelation that Utahraptor dispensed with these caudal rods causes me to distance myself from that aspect of the idea. As I have discussed before I think that those caudal rods assisted in long range, mid paced efficient travel and it makes sense that Utahraptor dispensed with them as it likely was the >the most predatory< and least adapted to facultative scavenging among known dromaeosaurids due to its size, extreme robusticity, and heavy investment in weaponry. Furthermore the loss of such rods helped the tail in flexibility as it could both deliver and take a beating. To better understand and see how we got to where we are today and where I think we will be going a quick review of the pertinent thought on the use of the killing claw in these animals dominated by two papers Manning et. al. (2005) and Fowler et. al. (2011) with necessary criticisms. The main death knell to the "ride the back of iguanodonts and slash at the sides with toe claws" hypothesis of dromaeosaurid killing technique came in the form of a mechanized Deinonychus leg built and utilized by the team of Manning et. al. back in 2005. They found that not only was the hole created by the claw very superficial but slicing through skin in order to create long gashes would be inefficient due to the skin tending to bunch up prevent said slicing. However, as John points out in his book such an analysis is lacking in terms of puncture depth because the experiment did not take into account the compliant nature of body tissue and that the claw can be pressed into the prey animal deeper via body weight and/or muscular force. Long story short the experimenters did not think with enough murderous intention. They did not think like prison inmates trying to achieve fatal blows with self made prison shanks. When body tissue is not put under pressure all the soft, delicate and gushy stuff is relatively safe due to the layer of integument, muscle, adipose tissue etc etc. But press into this tissue - with a prison shank or a dromie killing claw - and the margin of safety diminishes. Stick the knife in and twist. Critical reception to Manning et. al. is not however new and not isolated to John Jackson. Both Dave Hone (archosaur musings) and Mike Taylor (SV-POW) express similar notions in this interesting back and forth from Ask a Biologist. Many of the points they raise, especially with regards to the problems of "puncture and hold" and the likely inference of a sharp cutting edge to the killing claw can be extended out to criticisms of the now dominant RPR model of Fowler et. al. (2011). After Manning et. al. prescribed their case against killing claws slicing meter long gashed into the side of prey items the next big chapter in this saga came in a paper by Fowler et. al. (2011) that brought us the now dominant hypothesis of the Raptor Prey Restraint model (RPR) that proposes a certain commonality with modern birds of prey that grab prey with foot talons, flap with wings to maintain dominant position, and eat/dispatch with the head. As I have said in the past there is much to like here and it is not surprising that many have become somewhat smitten with the RPR restraint model. But as the authors themselves concede the grasping ability of dromaeosaurids is not >as mechanically strong< as modern raptorial birds of prey. Add to this; dromaosaurids do not have truly opposable halluxes like raptors - they can't do a good strong vice grip; longer legs decrease mechanical advantage further diminishing the strength of the grip; and dromaeosaurids had big foot and toe pads which would diminish the tightness of the grip. Because of the big foot and toe pads that dromies had getting a firm grasp becomes problematic, sort of like trying to grasp things with your own toes to a lesser extent. Not impossible for us and not impossible for dromies, but issues arise suggesting a less than optimal performance. But the final nail in the coffin for the dominance of the RPR model lies in the shape of the claw itself. It is not circular in cross section as we see in extant raptorial birds of prey but is laterally compressed like a knife is. It is just begging us to infer a sharpened cutting edges for the keratin sheath. Not to dismiss the RPR restraint model in its totality - I can picture small game and smallish dromies (troodontids especially) - pinning small with their #2 claw and even flapping with their arm wings a bit to maintain top dominance. However in larger and larger dromies this tactic becomes vanishingly feasible and outright ludicrous in Utahraptor sized dromies. It is, in essence the bio-functional equivalent to a fat guy in a little coat, two things combined that don't make sense. Which is exactly what the fossil record tells us. Remember we do have a certain Velociraptor locked in mortal combat with a Protoceratops. We shouldn't feel compelled to explain such a situation as abnormal or a very rare occurrence. It was common enough to enter the fossil record after all. And it is doing exactly what should be expected in the scenario John Jackson laid out in his book. Velociraptor is not hitching a ride on the side of the Protoceratops, not is it stability flapping or grasping the animal with all of its foot claw in some weird type of proto-raptor foot grasp. The head of the Velociraptor is poised to strike but may not be all that important for the killing. The arms and hand claws are very important in the predatory endeavor as they seek to restrain and stabilize the prey animal for ultimate dispatch by the killing claws. Given their increased range of motion and length compared to other theropods they performed a different role in predatory actions. They grappled with prey and helped to hold and stabilize prey which in turn allowed the killing claw to strike with better precision and accuracy. This is directly analogous to the manner in which large felids will grapple with prey using their forelimbs and secure the prey for dispatch via throat bite or nasal blockage. Finally the killing claws are doing exactly what they should be doing... killing!! They appear to be literally gouging into the neck region!! Poor Protoceratops!! 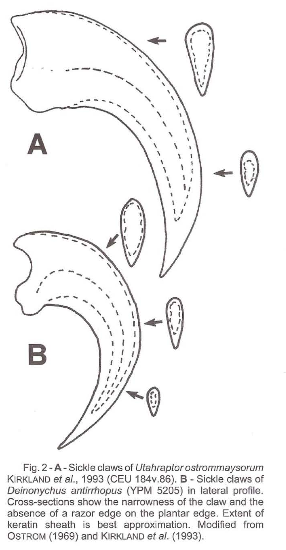 Carpenter also provides several diagrams of sickle claws with specific mention of a likely sharp cutting edge. Unfortunately Carpenter strangely backs off of the cutting edge aspect of the claw likening it to being "less sharp than a dull knife". Perhaps he was being a tad overly conservative, in any case Carpenter reasons that sickle clawed dinosaurs had such blunt claws because: "although we don't know how sharp the keratin sheath of a dromaeosaurid claw was, it was probably less sharp than a dull knife because there was no way for a dromaeosaur to hone an edge." Let's reason this out. Dromaeosaurs revamped their entire hindlimb morphology, literally raising digit two off the ground in walking posture. And we are to presume all of these sweeping morphological changes were done merely to create a claw with a sharpness less than a dull knife?!? Come on now. If we merely make the defensible assumption that the keratin sheath grew constantly then we can safely assume that the animal had to hone it down through use on prey items or why not simply hone its claw like a felid does? What's going to stop it? So when we add it all together we see this first iteration of the stab and kill from the inside hypothesis from Carpenter. Unfortunately Carpenter downplays several aspects of it such as the likelihood of a sharp cutting edge and for whatever reason the idea doesn't get much traction, even though it better explains the evidence than what Ostrom suggested or even subsequent works by Manning (2005) & Fowler (2009). Then comes along John Jackson, whom I don't recall if he cited or read Carpenter, but suggests an improved, but still problematic hypothesis, of sickle claw killing. Jackson gets it right I think in assuming a sharp cutting edge and that once the claw had penetrated and pressed into tissue it was free to repeatedly stab and traumatize tissue from the inside. Jackson thinks that the caudal tail rods of dromaeosaurids were necessary for this motion but I have my doubts and the revelation that Utahraptor lost its tail caudal rods but otherwise shows hyper carnivorous attributes supports this. 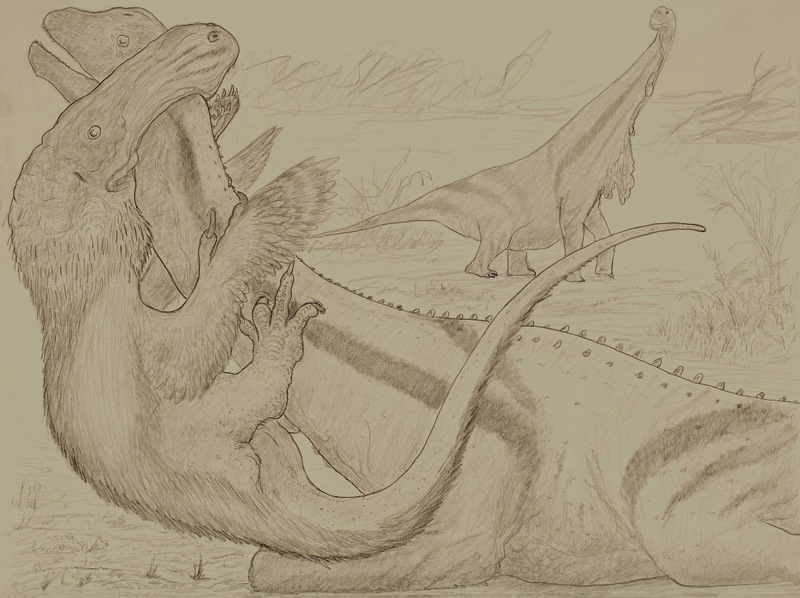 Finally it should come as none too great a shock that the burly iguanodonts, nodosaurs, and sauropods that Utahraptor shared its habit with and which formed its prey base all had a singular vulnerability - a vulnerable neck. 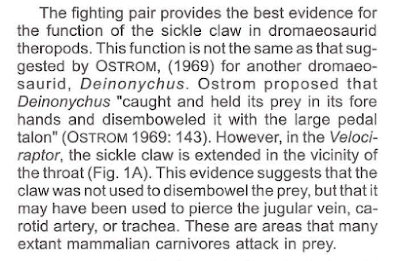 So that is where I stand with what I regard is the leading hypothesis on dromaesaur killing claw function. 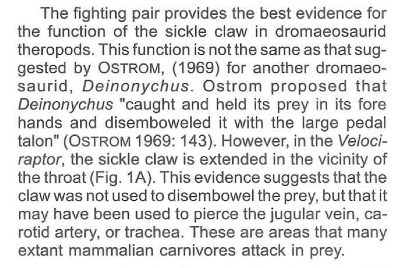 It is interesting I think not so much for what it says about dromaeosaur killing claws but what it says about us. It is a tale on the transmission of ideas and hypotheses - what counts as a good hypothesis and who is allowed to advance such hypotheses. It also shows how good ideas - though not necessarily perfect when advanced - sometimes get pushed aside or disregarded. Lost in the mix so to speak. But then later on they can get rediscovered, dusted off, and shown the light of day. I do think that this idea - or collection of ideas, the evolution of a hypothesis via disjointed bits and pieces - will ultimately be one that is nursed back to health, retooled and refashioned. Great post! I don't have any major questions regarding what you covered exactly, but I was wondering what you make of Utahraptor's teeth and how they changed throughout life. If you haven't seen some of the skull images online I can email it to you, because it's very interesting. Based off of juvenile/sub-adult specimens UMNH VP 20488 and UMNH VP 20487, it looks as though juveniles had a mild kink in the upper jaw. More notable though are the hooked teeth. They truly look like meat hooks. But as they age as seen in specimens CEU 184 v. 300 and UMNH VP 20501, the kink in the snout becomes far less prominent, and the teeth on at least the jaw begin to splay outward in a similar fashion to Masiakasaurus. What was going on with their niche since it's obvious they changed their feeding/prey capture mechanics? Sure email them to me. I don't really want to comment too much further on Utahraptor and it's teeth 'til publication. So in other words get back to me in about 20 years lolz!! Will you ever so posts on more obscure and or mysterious branches of theropods, such as elaphrosaurs, Megaraptorans (love em), Dryptosaurs etc? Because those groups deserve more attention I think. I never realized how flat Dromaeosaur pedal claws were. Interesting. But, looking at modern bird of prey claws, they seem kind of flat too. Wouldn't the keratin round the claws out a bit in life? Keep in mind that the claws could have also been squished during the fossilization process. But this is a pretty good hypothesis. Before I learned about RPR I had thought of Dromaeosaurs using their claws like this (targeting softer areas). Perhaps the "obligatory supination when wrist is extended" was an adaptation to grappling with prey? As important as the "Fighting Dinosaurs" specimen is, I think we should be a little careful about the conclusions we draw from it. You're forgetting the Protoceratops gave as good as it got: it's chomping down with a death grip on the raptor's arm. Clearly this represents a failed attack, and may represent the result of a non-optimal angle of attack on the part of the predator, whether from inexperience or a moment of cocky foolishness. @Lewis Bean no plans as of now for those groups. 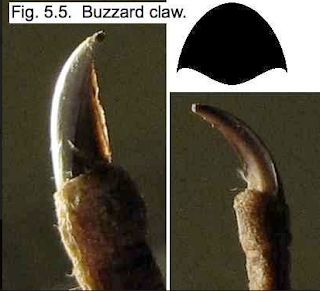 @MrCrow on "flattened claws" there has never been any suggestion as of such by anyone looking at or analyzing the specimens. Flattened specimens do occur but would be pretty obvious as the whole slab is squashed flat, not just an isolated claw. @Andrew Raymond Stuck Yes it clearly did not go as planned for the velociraptor - but things don't always go as planned for a lot of modern predators. The various dangerous and sometimes fatal bashings that lions receive by cape buffalo come to mind. Interesting post I must say. I agree that some of the larger dromaeosaurs may have indulged more in stabbing prey in neck, letting the prey bleed to death. I've noticed that some of the larger dromies have less curved claws then their smaller counterparts, as portrayed in the figure you posted comparing Utahraptor's claw and Deinonychus' claw. Perhaps this is an adaption to better stab into prey items, since it would be easier to pull out a less curved claw out of flesh then the highly curved claw of other dromaeosaurs. Perhaps another killing method that large dromaeosaurs could have used with their sickle-claws is the choke-hold method? They could bring their prey to the ground with help from their jaws and feet and then grapple the animal's neck with the powerful feet, choking the animal and digging the killing claw into arteries and windpipe, much like how modern cats do when they suffocate the prey animal they attack the neck (only with their jaws, not their claws). @sss Interesting idea about choke holding prey. I personally would be leery of it as the felid choke hold is quite the intricate predatory action. Felids are utilizing their whiskers and sensitive nerve pad to really hone in on a precise bite. I would caution that dromaesaurids would have less capability in these regards, the idea is not completely impossible, but I would probably lean towards a more coarser and brutal aiming of strikes to the general neck area. Or belly. Nightstalking dromies… Of course!! You know I'm actually of the notion that nocturnal predatory behavior of theropods should be our default assumption. Hello Mr Nash. I've lurked around your blog for quite a while now and am finally worked up the nerve to introduce myself. I agree whole heatedly with your conclusions in regards to dromaesaurid hunting techniques (By a remarkable coincidence I've just met Mr Jackson and am in the process of reading his book; so I took it as a sign). However while I agree with you in your comments section that a feline choke hold is unlikely for most dromaesaurids; I do recall that Dromaeosaurus itself did have a surprisingly robust skull and high bite force for a raptor (Therrien et al. 2005 I think it was). So even if it didn't kill via choke holds, it seems to be doing something different in regards to be either its method of predation, or possibly a shift towards different prey. Hi Jamale. Funny about you meeting Mr. Jackson. Hope to hear form you in future comments. I do think Dromaeosaurus shifted a bit towards a head dominant feeding/killing method it has been mentioned a lot before actually. I hope I have something to contribute; since I've cited your work before and I plan on taking a more active role in the community. I find it strange that Dromaeosaurus shifted to a head dominant hunting strategy; given that it seems that the tyrannosaurids were progressively moving in on their niche towards the end of the cretaceous, at least when they were youngsters, its strange to see to Dromaeosaurus going in the opposite direction. In a lot of my earlier posts I have expressed a desire to break free from this notion - somewhat pervasive - in the paleontological community of adhering to rigid niche partitioning and putting everything in an ecological box so it seems. Not saying that the niche concept is not valid or good just that it is a bit overblown in my estimation. You can, and we see this in modern ecosystems, have incredible overlap in diet and lifestyle and that is ok too, especially in productive ecosystems. Take lions and spotted hyenas for instance - incredible overlap. African hunting dogs also overlap quite a bit with hyenas and lions too. Right here where I live in southern California we used to have sociable dire wolves, smilodons, and American lions all coexisting with a smattering of other large carnivores. Now all of these examples partition resources to some degree whether it be where, what, or when they hunt - or even the type/degree of scavenging. But they do overlap a lot too. And sometimes that is Ok. My main point we should not have this knee jerk reaction of how could they coexist? I actually considered the "second claw as stabbing dagger" idea ever since I noted that the Fighting Dinosaurs fossil had the Velociraptor doing exactly that. I look forward to digesting everything and responding in due course. Howdy! Sorry for the delay - I had to write a nasty email to some people :-) . Thanks again for the mention. I'll work down through your post, maybe producing about three comment posts. I don't remember the Ken Carpenter’s treatment of droms (but thanks for the url); I wish I did - I'd have cited him. I wish he'd been allowed to handle them on the BBC TV programme "The Truth About Killer Dinosaurs". They let him do the bit on ankylosaur tails. Phil Manning did drom slashing. He provided me with a lot of juicy material for the book, that being the best. Er... "[BCF]...the evidence has not borne it out." Yup, it has. Always was the most explanatory theory. "Evidence is those observations not well explained by a theory, or not as well explained by one theory as another". It's all in the book! I don't think it's free, is it? Last price I plucked out of the air was 666 - and Amazon adjusted it to $6.60 . "we don't correspond anymore," Well, we did stop corresponding - I think I was when you said I wrote too much about philosophy of science! But that's where most people get it wrong! Or did we stop when you said I hadn't finished the theory? I was horrified that you thought some scientist-impersonator was better suited to "finish" the theory on which I was an expert! :-) . Anyway, it looks like we've resumed. Oh dear - you've recommended one of the chief scientist-impersonators of them all - Naish - as an introduction to me?! Well here's an intro to him: he knows no physics or chemistry, and none of the plethora of maths/computing skills essential to modern evolutionary science. His philos of science is the standard dismal - and he simply reads what others write then redelivers it from on high like a cross between Lady Bracknell and the Wizard of Oz. He does come up with some ideas - just like any opinionated bloke in the pub, but as usual, when he's right it's obvious, and when it's hard, he's wrong. And he couldn't find his way around a phylogenetic tree to save his life. "I have problems with cladistics too but don't think we should discount them." I've got an MSc in that stuff. You've got...? And I don't totally discount them. But, I think palaeo needs more people like you - displaying no fear towards all the little Wizards of Oz, and no worry about putting any future peer review issues for yourself in jeopardy! On the claw, and my chapter on it, I'm willing for you to put pictures, at least from that chapter, into this or other postings. One that might be useful is the buzzard's (buteo b.) claw, showing how the edge tapers to a thin, somewhat translucent and apparently cut-worthy edge. I guess you have the HTML version, with the folder that contains the pics. Another useful pic would be the black and white pic showing the lines of the supposed ligaments between the tail just beyond the transition point and the pubis boot. Another would be the view from above (chapter 1), with the T. rex, showing the wide area between the illia blades (above the spine over the hip joint) where the muscles for flicking the tail up would have been housed. Tail up-flick: sudden yank to a halt when the tail is halted by its indirect attachment to the pubic boot (itself braced by ligments ahead of it), and the basically rotational impulse can be channelled into the claw. The bony tail rods allowed the tail to bend but only under intense forces. The stiffer it is, the harder the sudden impulse to the claw. The reason the larger droms like Utahraptor and Achillobator have a less backward pointing pubis and less of the bony-rod tail stiffening, is because they didn't need the extra mechanical benefit of the whole dynamic tail thing. They were so heavy, just their weight was enough. With Velociraptor, it really did risk climbing up onto its prey or pushing itself away when it struck. The bigger ones also used their teeth in the attack apparently, since they didn't point completely backwards like e.g. Bambiraptor. That rearward pointing angle is I believe the best evidence that the claw was the killing weapon. The teeth could not be used for killing. They'd break under the inevitable occaisional strong sideways force. You describe the stab-with-squish bit well! Maybe it really is impossible to describe all that in a non-chilling way! Yes, Manning does have several critics on this topic. Yes - the somewhat sharpened underneath of the claw bone is very suggestive. No reason to doubt that is will have been sharpish and serrated. Odd that the caption to the diagram assumed the horny covering was blunt. Evidence??! And that was Bakker, wasn't it? I'm disappointed in him; I am, I'm disappointed. Front wing feathers: they may have had a use as blinkers over the eyes of the prey. It's widely suspected that young droms of any species might have been volant, for all we know. Maybe the wing feathers were retained into maturity for social signalling. I like your description of the fighting pair. I expect the neck was a prime target especially for some drom species, but the trunk might often do. I expect the neck frills of ceratopsians evolved at least partly as a defence against drom attacks. Also, although skin slashing might not have been strictly necessary, by sawing in and out with long strokes, and pressing down, the hide would be cuttable. Carpenter suggesting the edge was that of a dull knife might even have been true, since my plastic claw did the job, and wasn't astonishingly sharp, and wasn't serrated. Still worked. It's certainly true to say "...good ideas - though not necessarily perfect when advanced - sometimes get pushed aside or disregarded." Lewis Bean: I think Megaraptor did the same thing with the hand claw (but without tail-assistance). MrCrow: Sharp edged claws have ways of self-sharpening, if ridges and layers of differing hardness are used. Andrew Raymond Stuck: The fighting pair Velociraptor did lose out that time, but it was probably distracted by a sand-slip. Hi Jamale! Nice to meet you here! Dromaeosaurus I agree did have a suitable skull and teeth for use on live prey - to some extent at least. Maybe the toe claw is more suitable for prey larger than the predator; with medium or smaller prey the teeth might do, and the toe could be a useful back-up. Bk Jeong: Yup - it does look like it's being used as a dagger. It took me a while but I got to it!! For the sake of simplicity I'm only going to "stab" at the issue regarding the killer claw dagger technique. Yes Ken Carpenter appears to have had an iteration of this idea, his only fault I think is that he did not sell it hard enough and he seems to discount the likelihood of a sharp cutting edge. On photos and illustrations, probably you are right. However a lot of the response to this has been somewhat positive and people are generally amenable to the idea of a sharp cutting edge. As I linked to the discussion from Hone this includes paleontologists of general repute. Now I know that thought might set you off a bit, but critics have to take a step back and concede it is not just Nash saying this, or Jackson, but others too. It is not such a bad thing to find some commonality of agreement. I would like to use the buzzard to claw picture with cutting edge, I don't have the book anymore and my computer is so outdated right now I don't know if I can even download your book. If you can email it I would put it in. On the tail. I have to admit that is a part I have difficulty with. However getting at a better understanding of the killing claw and how it actually killed (not hitching rides and not pry restraining) is a good starting off point. As I've iterated in the past I think the tail had more of a role in efficient, moderate paced distance traveling. And this is where I differ from not just you but several what we shall call more mainstream interpretations i.e. these animals are often thought of as quite slow and inefficient travelers. You do understand that if I differ in opinion and thought from what we can dub mainstream thought that I can also differ in opinion from you right? I think that's fair. I also think I have been fair in giving your thought and critiques on the killing claw an avenue where, let's be frank, many would go screaming for the door at the prospect of associating their name with yours. I think you would agree. As I pointed out in the post I don't want this to drift into BCF discussions, and I especially don't want to get into personal quarrels with researchers so no comment from me on those fronts. But let's just say my silence does not equal consent or agreement. I just, for personal reasons, don't have the stomach for vitriol right now. Again, I kept my word and I gave what oxygen I could to your iteration of the killing claw technique I came across from your book. I doubt most even read it. Again I think you are right in some major points regarding the claw usage. That being said I will be moving on from this topic in future posts so there will be no follow up posts from me on this subject in the immediate future. I have to many other things to get to. I've been reading through your blog posts for a while now, and I love your 'out of the box' ideas. I may not fully agree with all of them per say, but I can totally respect your grasp on the idea that life is weirder (and sometimes scarier) than we can ever really imagine. And, while I may not have agreed with some other hypotheses you've discussed, I can say that I'm pretty much fully on board with this one. It makes total sense for such a large (and now excessively bulky) animal like Utahraptor to refrain from jumping around on top of things and hanging on. Such reckless behavior would probably end in a lot of dead Utahs when the prey it had to deal with was usually either huge or armored. I would like to add that I think that there's no reason such a widespread structure as the 'killing claw' couldn't have been used for slightly different functions depending on the species of Dromie though. While the RPR method may seem nonsensical for a monster like Utahraptor, I don't know if I see it as out of the realm of possibility for smaller animals like troodonts and smaller raptors (maybe even Deinonychus if we're pushing it a little?). Also, what's your stance on raptors living in groups? I don't recall you discussing the matter in your 'Make Raptors Nasty Again' series. Forgive me if you did. Personally, I think it would have depended on the species, but that at least some of them did based on trackways in Asia. Anyways, keep doing what you do, and I hope you're doing well! Hey thanks for comment. Don't know if you have came by before but please leave a name next time. On RPR perhaps being used in smaller dromies/troodontids/microraptors: Yes I did mention this in the text, its entirely possible. On group behavior: No I did not get explicitly into this aspect but I think there is a definite argument in favor of. Stay posted for future work on the subject of social dinosaurs/parental tasks etc etc I will probably be pivoting in that direction shortly. Currently I think social groups were based upon growing up with clutch mates. Just realised the picture of the Utahraptor claw etc was from the Carpenter paper, not the Bakker paper that I was thinking of - though the same or similar pic did appear in the Bakker paper on Utahraptor I'm sure. I love the bald tail on your Utahraptor. I've speculated about larger Dromaeosaurids losing their tail feathers for thermoregulation. Nice to see some convergence in thought. I'm not a paleontologist but an independent researcher who grew tired of the obviously misinterpreted use of the killing claw. Thank you so much for bringing new ideas to the dromaeosauridea. If I had to listen to another PhD speak of pack hunting, claw slashing raptors I would have given up. I do believe they scavanged at a higher rate than most theropods, but I'm not willing to give up on the RPR. You said the final death nail to the theory came after the robotic foot experiment, when I thought that was the study that in fact lead to the theory. The animal could attach itself to it's prey with it's claws and dispatch it with it's jaws. The overall gripping strength of the feet wouldn't have to be as strong as modern birds of prey, as the forearms would have assisted in the animal latching on. Wing pummeling seems a little inefficient to be the main way a predator kills it's prey. And the presence of boney rods in the caudal vertebrae would have been more present in arboreal drommies. Rpr may not be nonsensical for utahraptor. Perhaps the "stabilizing per flapping" aspect is, but I don't think it's plausable for any of the dromaeosauridea. However, using it's pedal and manual unguals to scale itself up the flanks and onto the backs of large prey may have been possible. It would remain firmly attached and the beast could dispatch it with its jaws. @unknown Thanks for comment. Maybe I was imprecise on my language but the Manning/robotic foot experiment was the nail in the coffin for the ride the flanks of large prey and slice idea. Manning felt they could still ride the sides of prey and now bite. I am OK with RPR for smaller dromies/microraptors/troodonts I just find it nonsensical for larger dromies. I agree that wing pummeling is not a good killing technique which is why I now disavow it. I believe I evinced this change in opinion somewhere in the post. @Josh B. Hitching a ride on the flanks of prey is still possible but not very practical. First of all you have the issue of dromie bite force and are they going to get a very good bite on the broad and tough hides of large dinosaurs? Probably not. Its a lot of risk. Much more sustainable to target immature specimens that can be grappled with and delivered a fatal blow via the killing claw into the neck. This is what felids do and they can take down relatively large prey - even larger than themselves - with precision and >the least< amount of risk. Birds, like all predators kill with their jaws. Pedal digit 2 is most likely an arboreal adaptation. Look at the rest of their anatomy - long stiff, balancing tail, forlimbs like wings. RPR has not been disproven for dromaeosaurines, and their robust skulls and teeth are sufficient for killing. Utahraptor teeth must be addressed.